There were three men from Yemen that sued NASA claiming NASA was trespassing as they inherited the planet Mars from their ancestors 3000 years ago. Eminem’s mother sued him for 10 million dollars regarding the remarks he makes about her in his songs. She walked away with 1600 dollars only. Monsanto sued a milk producer in 2003 for advertising hormone-free milk. The film “A Man Apart” was originally named “Diablo” until they were sued by Blizzard Entertainment. John Fogerty was sued by his CCR record label for sounding too much like himself after his solo career. A woman from Michigan once sued the makers of the movie Drive because it wasn’t as action packed as the trailers had described. Before the Great Depression, it was common for a man to be sued for monetary damages if a man broke off an engagement. Apple Corps, founded by The Beatles, sued Apple Computer for trademark infringement. They came to an agreement that Apple Computer will not enter the music business. A woman was sued by her husband because their baby was too ugly. It was founded that the wife underwent plastic surgery before the marriage and the husband, therefore, won 120 000 dollars. A 4-year old was sued for accidently driving her bike into an elderly woman. A woman sued two teenage girls who knocked on her door to offer her cookies causing her to have anxiety attacks and she eventually won 900 dollars. When Scottie Pippen went broke he sued his lawyers as they did not “monitor” his private jet purchase. The USA successfully sued Britain because they freed slaves during the 1812 war. McDonald's sued a health company called McWellness and claimed they could possibly enter the health industry eventually. The company Sony once sued itself. Petroleum companies have the rights to most Battery patents and sue anyone who uses them. 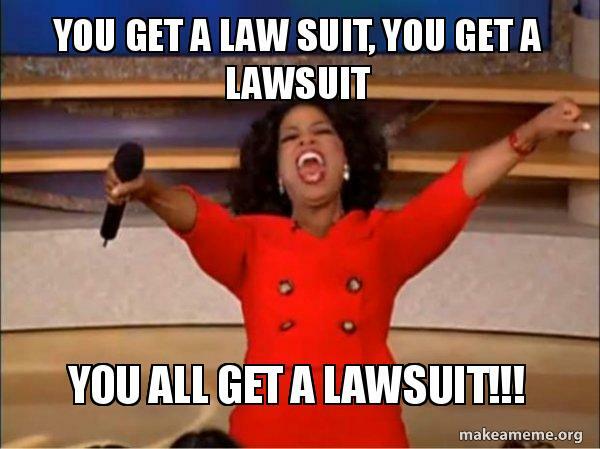 After Oprah Winfrey mentioned that she would not eat another burger after the show about mad cow disease, she was sued for 11 million dollars in damages. The Guinness world record for the most lawsuits filed in the world went to Jonathan Lee Riches. He sued Guinness Book of World Records to remove his name after he heard about it. Astronaut Neil Armstrong sued his barber after his barber sold his hair to a collector for 3000 dollars. A hyena biologist sued Disney for portraying hyenas as villains in The Lion King movie. During the year 2000, Wal-Mart was sued more than 4000 times, about once every 2 hours. Kayne West was sued by Evel Knievel over damage to his reputation in the ‘Touch the Sky’ music video.